BANAUE, Ifugao (PNA) -- The Banaue Rice Terraces, dubbed as the Eighth Wonder of the World, are the product of the religion and culture of the Ifugaos. For thousands of years, it stood as a symbol of human ingenuity. encircle half of the globe. come the much-needed water for irrigating the terrace. the first to be inscribed as a continuing living cultural landscape. rice terraces sites, namely, Nagacadan and Julungan. traditional lifestyles of the Ifugao continues, Dulawan said. harmony between culture and nature is the essence of the Banaue Rice Terraces. social changes brought about by the influence of several factors. Christianity and education have weaned young tribal people away from their tribal customs and from their land and agriculture. Many tribal people are assimilating lowland ways and moving to the lowlands where many economic opportunities outside farming beckon. Many government systems have intruded tribal leadership structures thus weakening the observance of tribal rituals. commercialization of culture in relation to tourism. knowledge of tribesmen on water and irrgation management programs and partly due to the massive influx of tourists into the area. 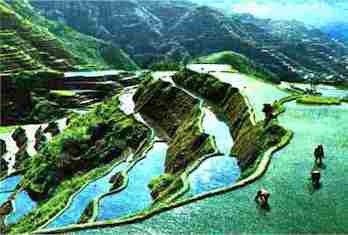 All these components of the terraces system must be taken together if the rice terraces is to be restored.